The washing machine and clothes airer are located in the under stairs cupboard within the bathroom. The cottage is heated throughout with underfloor heating. There is Sky+ with Variety, and Style and Culture packages. There is courtyard parking for one car. On road parking is easily available within 20 mtrs of cottage. The very quiet and secluded gardens of Courtyard Cottage make a great place for the children to play, please note that there are 2 shallow nature ponds in the garden. The orchard gardens are perfect for enjoying a BBQ and a bottle of wine on a summers evening. Fantastic cottage! Perfect for our family stay in Yorkshire. We loved staying in this cottage in Yorkshire. As a family of six it had everything and more we needed to make our stay relaxing and comfortable. The owners have really made this a place with everything you could need with children in tow, games, dvds, books plus an amazingly well equipped kitchen! Everything was spotless and warm for our arrival...... a true home from home. Thank you so much Sally and Andy, we will definitely be booking here again when we return to Yorkshire for our next visit. Stayed for a week in October and had a great stay. There was everything we required for our stay, the cottage was very clean and comfortable. 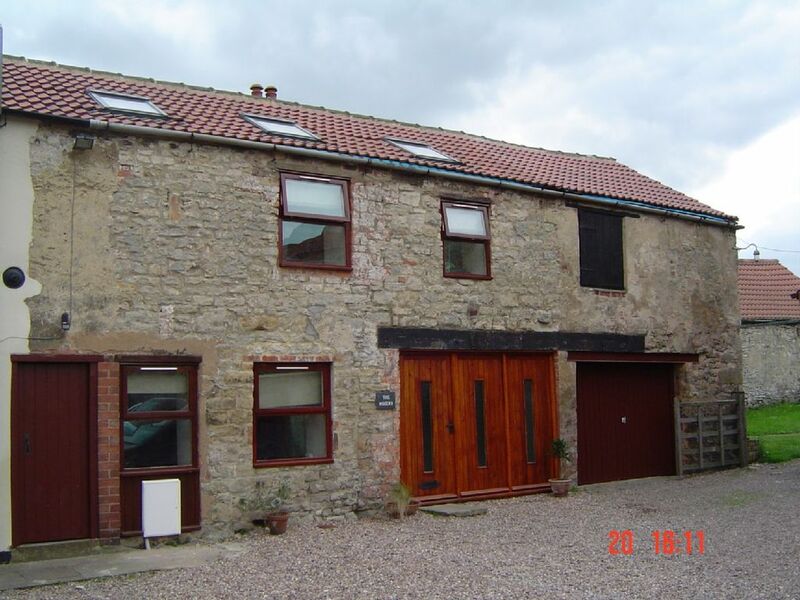 The cottage is located in a small quiet village which is in a great location for access to York and the surrounding area. There are two pubs within walking distance, but no shops. There were lots of DVD'S and games for evening entertainment, and lots of useful local information. On arrival there was milk and bottle of wine in the fridge and sweets and biscuits on the table, which were much appreciated. We really enjoyed our first trip to Yorkshire and will be visiting again. old entertained for the week. Thanks Sally and Andy. Contemporary cottage, with poor first floor ventilation. The cottage has a modern, contemporary interior with all the facilities necessary to enjoy a family holiday. In particular, we appreciated the wide range of DVDs and toys that were provided for family entertainment. The views from the terraced cottage were disappointing, with only the courtyard and other close proximity buildings to admire from its boxed in location. However, a short walk out of the courtyard and into the picturesque village reveals much more pleasant Yorkshire countryside and character. Our visit was during the warm summer month of July, this critical point is relevant because the living/dining area is on the first floor as is the divan bed for additional sleeping quarters. Unfortunately, despite opening windows, the heat that was generated within this sleeping area was unbearable and trying to sleep under these conditions were impossible. A tower fan is provided, but its performance was poor and its excessive noise only compounded our discomfort and misery. Our solution was to retreat to the ground level bathroom and utilise blankets and pillows on the hard tile surface where we were able to obtain some form of rest at least. This became an inconvenience to all when the toilet was required and the whole situation just became unacceptable and completely ruined our holiday. Rather than endure further discomfort, we decided to cancel the remaining day of our stay explaining the above reasons to the cottage owner, who although sympathetic, offered no refund despite the conditions that we had to endure. We feel we have to respond to this 1 star review. We would just like to point out, that we are currently, in the UK, experiencing the hottest July ever on record. Everyone in the country, including ourselves are suffering from sleepless nights due to the unbearable heat that we are not acclimatised to on an evening. These guests advised us that they were leaving a day early due to this, and we felt that they had made their minds up on the decision as they did not approach us for help or suggestions to make their stay more comfortable. i.e. hire of an air-con unit? We had noticed when we arrived home late one night that the 2 windows and 3 velux windows were closed?!? Hardly surprising it was stuffy? The tower fan we have purchased for such needs, is weeks old, of a new design, and has variable settings for speed and oscillation, and we now are suspicious that perhaps this wasn't operated correctly? It certainly is not intrusively noisy as suggested by the guest, who also commented that the wall clock ticked too loudly! We take on board all constructive criticisms and endeavour to act upon them given a chance. We feel that a 1 star review is extremely harsh, which is basically due to the unprecedented inclement weather and not the property itself. Visit the historic walled city of York, with its famous Minster, Shambles and Castle Museum. Or visit cosmopolitan Leeds with theatres and art galleries a plenty, The Royal Armouries, Corn Exchange & Markets. The spa town of Harrogate, or the smaller market towns of Wetherby, Ripon, Pontefract, Thirsk, Northallerton or Skipton many with their own racecourses. Along with the above, visit one of two of the regions largest shopping malls, within 15 mins drive to McArthur Glen York or Junction 32 Castleford Xscape. Locally you can enjoy Lotherton Hall & Bird Gardens, Temple Newsam House & Gardens, Harewood House & Bird Gardens, Bramham Park, and Roundhay Park with its adjoining Tropical World. On our doorstep is the famous battle ground of Towton Moor where the War of the Roses took place in 1461. Due to our fantastic central location we are within easy reach of many fabulous attractions that Yorkshire has to offer. Too numerous to mention further details are displayed in our info pack.